In a previous post I had said that my Father was in a Short Term Care Centre near Barnsley. His mobility had improved and he was warm and comfortable. We were happy that this would be better for him than staying in the cold house he had in Cawthorne. Sadly the improvement was short lived. His mobility worsened, he was losing weight and complaining of backache. Recent tests at Barnsley General Hospital showed that the backache was caused by a tumour on one of his kidneys which they thought was cancerous. My brother Brian has visited him each day and was able to observe the rapid deterioration in his health, especially during the last week. Yesterday they took Father back to Barnsley General Hospital because he had a chest infection. Upon examination they found that the cancer in his kidney had spread to his lungs. Sadly this morning he died peacefully. We are pleased that he did not suffer and that his end was quick and painless. He had made it clear that he didn't want to be at the Centre nor could he stay in his house. For him passing away was the best alternative. 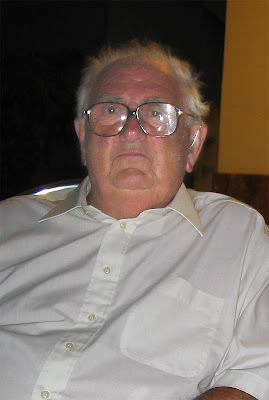 Father was a well respected person, loved by all who knew him. He had a great sense of humour and a very caring nature. We will miss him a lot and always be grateful for all that he taught us. He his now reunited with my Mother who he had missed since her death over fifteen years ago. Pam and I are flying to England tomorrow and will be there for about a week. So if there are no posts for awhile you will understand the reason. The first snowfalls of the year hit the Costa Blanca on Wednesday causing problems inland. From Busot to Gandía many areas were covered in a blanket of snow. In Busot, the nearby Cabeço d’Or, which is very close to Alicante, was topped with snow as were most peaks along the coast – including Aitana, Puig Campana, Bernia and Coll de Rates. In coastal areas as much as 70 litres of rain per square metre fell and in Jávea temperatures never went past the 5C mark. Banyeres registered the lowest temperature of -2C. Snow and heavy rainfall forced the closure of many inland roads and gave around 10,000 schoolchildren an early start to the holidays by forcing schools in 11 towns to close. Guardia Civil traffic police had to reroute heavy lorries trying to pass through the mountainous Alcoy area as treacherous conditions made it impossible for them to get through. Only cars fitted with snow chains were allowed access to some of the roads. I understand that some people on our estate are having problems using the Bigastro mail server for email. I posted information about how to obtain a Bigastro address on the 7th November. We still don't have either a Wi-Surf mail account nor a Clear Communications one. 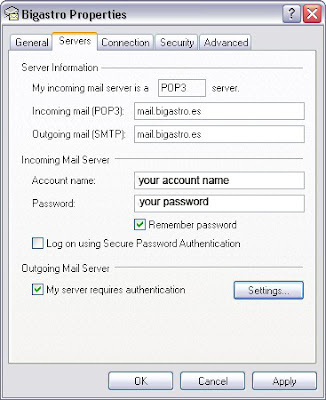 The only way we can use Outlook Express for mail is to set up an account with a provider that has POP3/SMTP servers. 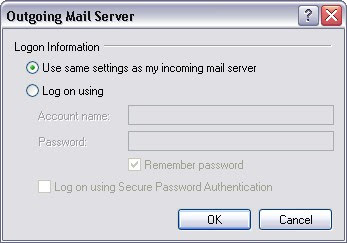 You need to set up a new mail account in Outlook Express. The email address is the one which you obtained from the Town Hall; e.g. yourname@bigastro.es. Having typed that in the first dialogue box as your Email address and Reply address, you need to set up the Server settings as follows using the account name and password you were given. It is important to check the box "My server requires authentication". Click on "Settings" and in the next box select "Use same ......." and click OK. 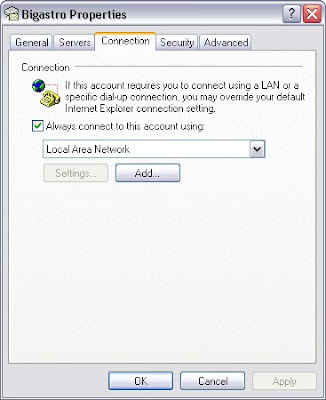 Finally make sure that the Connection is by Local Area Network. You should now be able to send and receive mail via your Bigastro account. You can either disable your Wi-Surf account by unchecking "Include this account when receiving ...." or delete it altogether to prevent error messages about the Wi-Surf server not being found. The Town Hall has published these pictures of us singing to the children at the Infant School. 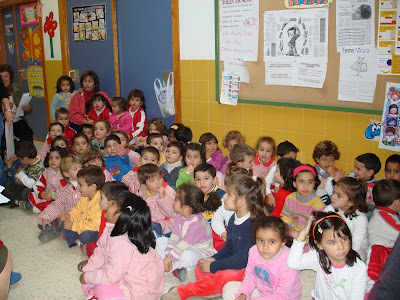 Ana, our teacher, is on the right of the back row wearing a white top. ...as David Jason used to say in the "Darling Buds of May". Our friends John and Jean came for Christmas lunch. We had an excellent meal washed down with some great wine followed by the finest Spanish brandy. I even had a superb cigar to smoke. What more could you ask for. Good company, good wine and a decent cigar. We spoke to the girls and Pam's dad who were all well and enjoying their Christmas'. As I said - just purfect. It takes a while to get to know your new neighbours well enough to find the right present for them. Ken and Kay next door obviously have our tastes well worked out. This little fellow will look great on the table outside in summer. I just hope he doesn't get worn out carrying too many bottles. 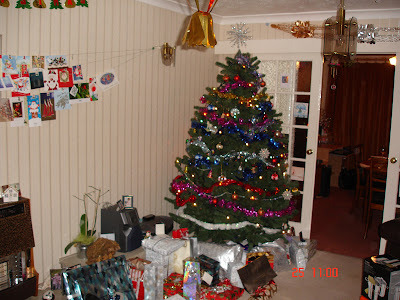 This is the Parry-Jones' tree on Christmas morning. Looks like they had a lot of presents to unwrap. Santa must have been well pleased when he'd dropped that lot off. Peter and David Brooks live in a beautiful old house in Newsham Park, Liverpool. Magnificent houses demand magnificent trees. 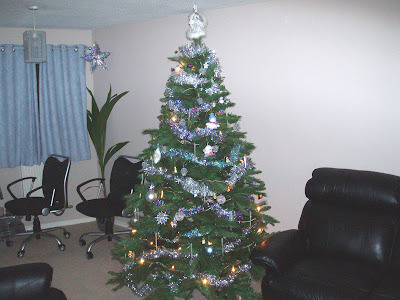 This is the 2m tree they have in their lounge. and the 3m tree in their hallway. Has he been your way? Santa has definitely been to Bigastro. We spotted him climbing up to this flat. A very Merry Christmas to one and all. Cooking the turkey on Christmas Day is always a problem. You have to get up early to get it started. Then the oven is isn't available to cook other things like the parsnips and the roast potatoes until the turkey is done. 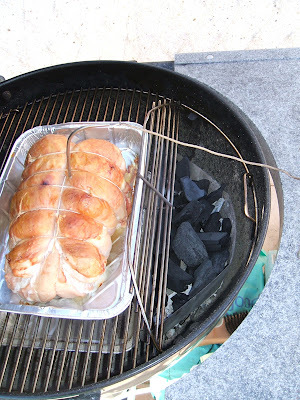 For several years now I've cooked our turkeys on my charcoal BBQ. 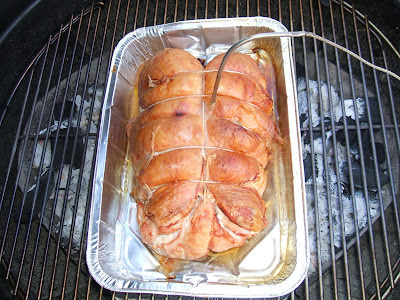 I would cook whole birds on Christmas Day because as the skin cools it wrinkles and doesn't look so good. This turkey crown though will cut better when it is cold. 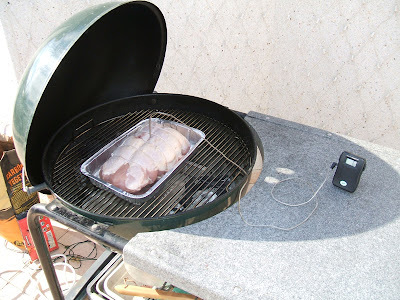 The wireless thermometer means that I don't have to worry about whether the turkey is properly cooked. Once the correct temperature is reached the meat is done. It also means that I don't have to keep opening the barbecue to check progress. Each time you open the hood it lets the hot air out. 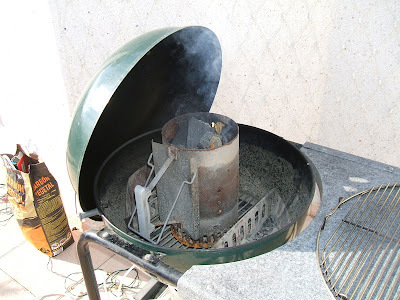 The chimney starter lights the charcoal quickly and evenly. 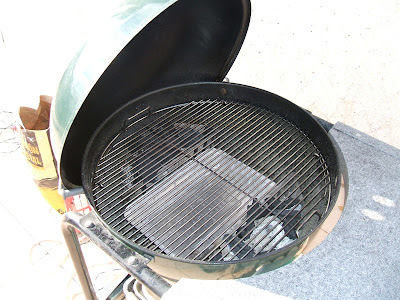 Placing the charcoal in baskets each side with a drip tray in the middle means the BBQ cooks like an oven. Without direct heat underneath, the meat doesn't burn. Ready to start cooking. 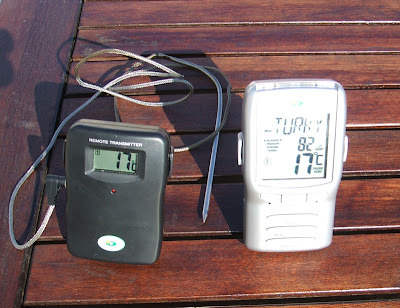 The temperature probe is in the middle of the meat. Adding more charcoal after about an hour by lifting the hinged grate sides. Done to perfection! The final temperature in the middle was 82 degrees centigrade. 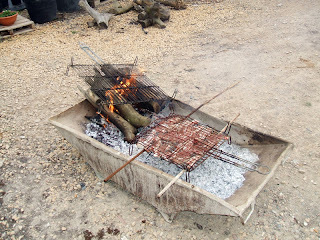 PS Don't try this on a Spanish style chimmnea BBQ otherwise your turkey will have burnt bottom! 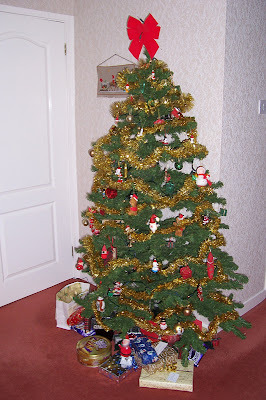 On the 7th December I posted a picture of our Christmas tree and invited you to send me a picture of yours. Well quite frankly the response has been disappointing! In fact these are the only two contributions I have had. It is not too late though! Get out your digital camera, take a picture and email it to me at keith@thewilliamsons.me.uk. Many thanks to Richard and Chris - a very merry Christmas to both of you. Torrevieja’s main square was alive with the sound of music last Friday evening as thousands got in the festive spirit to take part in the English Carol Concert. 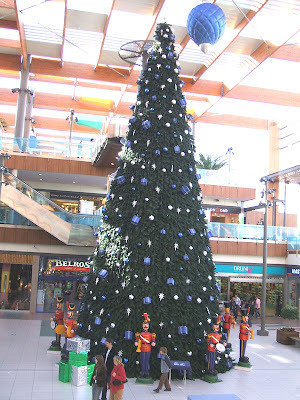 Organised by the foreigners office and the town hall, this was the fourth year of ‘Carols in the Square’ and early reports indicate more than 5,000 people of all nationalities, enjoyed the festivities, which has now become a permanent fixture on the Torrevieja calendar. The seafront at Torrevieja came to a standstill last Saturday as a procession of around 40 Santa’s on motorbikes descended on the town. 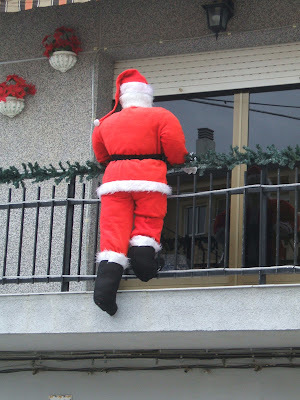 The biker Santa’s, who are all friends from a number of bike clubs, were on their fourth annual outing armed with bags full of sweets to throw to the children as they weaved their way from Rojales to Villa Martin, calling at Quesada, Guardamar, Torrevieja, Los Montesinos and San Miguel. This display is outside the barbers' shop. The basket in front of Santa is full of sweets for the children. Quite where the tiger fits in I'm not sure. Perhaps he is the nearest thing they had to a reindeer. 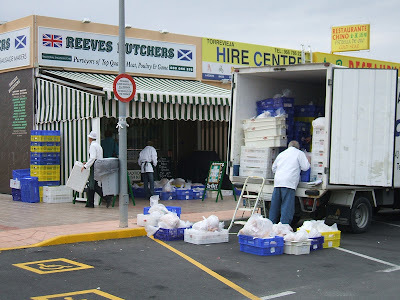 We went to collect the turkey crown from Reeves the English butcher. I guess you could say they had quite a few orders! The van was full, the pavement was full and the shop inside was full. Well a big bonus really. On our way back from shopping we thought we would stop by at the Garden Centre, Bigastro to see Eva who had been so helpful when we were starting our garden. We'd seen Eva in the market on Thursday which reminded us that we hadn't called in to see her for some time. We gave Eva her Christmas present and were about to leave when she invited us to stay for lunch. 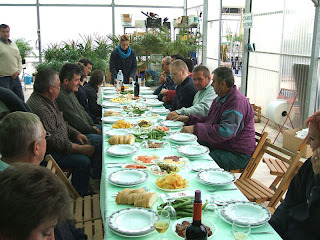 At the back of the greenhouse was a table laid out for the staff Christmas party. So we couldn't say no. In fact she wouldn't let us say no. The food was all Spanish off course. Prawns, meat, fish, cheese and pickles to start with. Then soup which had egg yolks and meat balls in. This was followed by lamb steaks and chicken cooked on the barbecue. Then there was chocolate cake, biscuits, pineapple and mandarins. 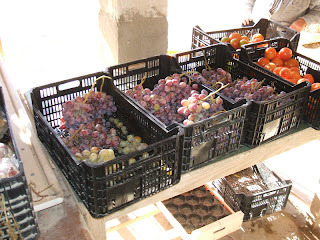 Of course there was lots of fresh bread and red wine to accompany the food along with broad beans in their pods which you eat raw. To finish the ladies had Baileys in little chocolate cups and the men whisky or gin. An unexpected pleasure which we were very grateful for. I ask you; how many garden centres in England would invite you to join them in their Christmas party? Well they tried the Barclays "need you to send your bank details" scam and now this. What a surprise that they also need my bank details to process the claim. I particularly like the warning at the bottom of the message. We are pleased  to inform you that your  EMAIL ADDRESSE  has been selected as one of the 10 lucky winners in the email lottery programme conducted by the EURO MILLION on the 30th of december,2005. The late release of this result was due to difficulties encountered in sorting out mixed up numbers and email addresses. All 10 winning addresses was randomly selected from a batch of  500,000,000 international emails. Your email address emerged alongside with 10 others as a Numeros "5 " winner in this year euro million award Draw. Most recently the foundation set up the NEW HOPE LOTTERY to give out prizes based on the computer balloting system (THEREFORE YOU DO NOT NEED TO BUY A TICKET TO ENTER FOR IT.YOUR EMAIL ADDRESS WAS RANDOMLY SELECTED AS A WINNER). As a Numeros "5 " winner, your lucky email address was selected by the email computer balloting device, where only email addresses are sorted ,from a total number of 500,000,000 international email addresses drawn from all over the globe, only ten winners emerged in this category. You winning email address has therefore been approved  a lump sum payout of €466.812,79(Four hundred and sixty-six thousand ,eight hundred and twelve euro seventy nine cent) in cash credited to file REF.NO: ES/04678/SA . This from a total cash prize of  €4,666 127.09 (Four million six hundred and sixty-eight thousand, one hundred and twenty seven euro ,nine cent) shared among the 10  international winners in numeros “5. Below are the particulars attached to your LUCKY WINNING EMAIL . SEND REQUIRED INFORMATION BELOW TO YOUR CLAIM AGENT . The above claim agent will assist you in the processing and remittance of your winning prize (funds) to you. 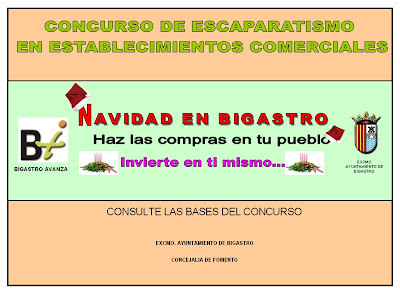 Also note that  you are to contact and process your winning prize not later than fifteen  days, AFTER this date if you do not contact and process your winning prize, all funds will be returned to the MINISTERIO DE ECONOMIA Y HACIENDA  as unclaimed. 1.Please quote your Reference Numbers ,Your full name and address, Country, Telephone ,mobile ,Fax number and occupation to your Claim Agent. 2.Your winning prize  Has been insured to the Original value that no one else can lay hands or what so ever to make claim of your winning prize except you the Beneficiary of this Email address. For  more verification on your lucky winning email prize, you are to visit our online website page ( http://www.loteria.com/euro.php) and indicate the date this email lottery programme draw of the EURO MILLION was held [30th (dia) -12(messes)- 2005(ANOS)] and there you will find your result winning number(8-16-19-43-45-1-4 ). Once again on behalf of all our staff, CONGRATULATIONS!!!. This promotion program is sponsored by EURO MILLION TO ENCOURAGE THE USE OF INTERNET. All information’s have to be kept out of public until your winning prize has been processed and transferred to your designated bank account; this is to avoid double claim and unwarranted abuse of the programme by some participants. Copyright © 1994-2006 The Euro Millions Lottery S.l.. I had an email from my brother Brian telling me that my father had now stopped walking altogether. Not only that but he has lost a stone in weight in the last week. Worst of all though he is passing blood in his urine. So he has gone to Barnsley General Hospital for investigation. He remembers nothing which is a clear sign that the brain is shutting down. Sadly when that happens the body functions follow. So as I have said to Brian, I think we have to prepare for the worst. The Local Corporation of the City council of Bigastro wants to extend to all its citizens its best wishes for Christmas and its hope for peace and prosperity in the New Year. Well, well, would you believe it? On Tuesday 19th, in the afternoon, the Internet connection just disappeared. I was half expecting it at anytime not because of some technical problem but because finally Wi-Surf had gone bust. A phone call to Clear Communications confirmed my suspicions. Their satellite provider had pulled the plug because Wi-Surf had not been paying their bills. A quick trip up to the Pedrera confirmed that the satellite dish had gone and then the server was switched off. Both were sure signs that we had a problem. Steve, get a life, I do not care about your petty squabble with wi surf.Why would I or anyone else want to hear your misinformed opinions on wi surf ? I was simply an investor/shareholder in the company there for I am not responsible to you or any of it's customers. I own shares in BT and this doesn't mean I'm accountable to it's customers no more than i am to Wi-Surf customers. Well PRF left Wi-Surf to set up Ispirese on the 2nd August and sent all Wi-Surf customers an email telling them that Keith McClure had taken over his shareholding. So who was actually in charge of the company remains a mystery. Best of all though, Wi-Surf recently had the gall to ask its customers to pay for a year’s subscription up front offering them a hefty discount for doing so. I didn’t get the letter offering me that deal but you can guess what my reply would have been if I had. The good news is that our connection has been taken over by Clear Communications using ADSL over microwaves. The bad news is that I had already paid for December's connection and Clear Comms. have just taken January's payment. Still that will see us through until February and we only waited three days to get back online. 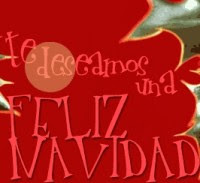 Muchas gracias Clear Communications - Feliz Navidad. I've found the time this morning to renew my backups: first all the digital photos I have stored on my computer from November and December. Once I have transferred photos from my cameras to my computer, I reformat the memory cards. So if the SATA drive the pictures are stored on fails I will loose the lot. Then I backed up my downloads of programs. Again if the C drive fails I will loose all the new program files and updates that I need to restore my computer. I know hard drives are very reliable but we did have quite a few fail at the school where I worked. Making backups is a pain in the a*** to do but very necessary. Next up I have an Epson AcuLaser c900 colour laser printer which I use to print out most of my stuff with but for photographs it just doesn't cut the mustard. The prints are on plain paper and the colours are not quite right. So for photographs I used an Epson Photo 870 inkjet. This printer was showing its age though. I only used it occasionally so each time I had to go through the cleaning cycle several times to get the ink back to the print heads. Even then the colours were "off" with prints showing a distinct magenta cast. Correcting them in Photoshop helped but took forever. So I have treated myself to a new HP Photosmart D7360 printer which arrived from HP Espana last Friday. Not only is it very accurate in terms of colour it is a lot faster too. As a bonus I can print directly from either camera using the Pictbridge connection or by inserting the memory cards into the slots on the printer. Although I've tried it using Olmec Optimum paper which I already had, I understand that for best results HPs own Advanced paper is the one to go for. I can't wait to see how good the results are using the "right" paper. HP claim that their Vivera inks are fade resistant for 200 years. I won't be around to check on that but hopefully my heirs will thank me for making the right choice. We went to the infants' school, La Paz, to sing our carols and were greeted by the Headteacher who recognised Pam and I from last year. Although our numbers were depleted i.e. there were only five of us, we held our own and treated the children to some traditional English cheer. After refreshments at La Paz, we returned to the classroom where we have our lessons for even more refreshments. which means "thank you for working so much and for cheering the classes"
which means "you work a lot and well, now you need to make the effort to speak a little more"
Ana then gave us all presents; a pen and pencil set from the Town Hall along with candle sets for the ladies and pen and calculator sets for the men from her. We are so lucky to have such a good teacher to help us learn our new language. Turron is the traditional Christmas sweet in Spain made from a mixture of sugar, honey, almonds and eggs. Apart from the hard, jaw breaking varieties there are softer versions for those of us who would like to keep our teeth. There are versions with candied fruits, chocolate flavouring etc. - all sold in elaborately decorated tins and packets. 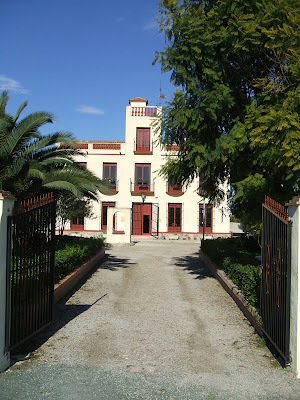 The main centre for turron production is of course Xixona which is inland from Alicante and apparently is well worth a visit to see the factory where the nougat like sweets are made. 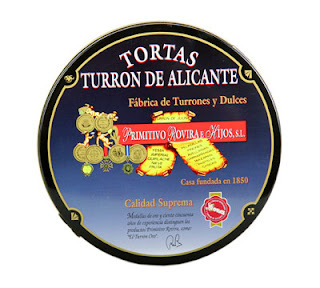 You can find out more about turron and other traditional sweets at Turrones Palmira and at Primitivo Rovira. The other traditional sweet for Christmas is Polvoron which is a lot less harsh on the teeth but can can be very messy to eat when it crumbles to dust as you bite into it. Competitors are asked to write or type a Christmas story. The completed piece should be no more than five pages. The finished entry should be bound and should have a picture on the cover. The competition, which closes on the 20th December, is for three categories. Infants: 6 - 14 years of age. with prizes in each category. 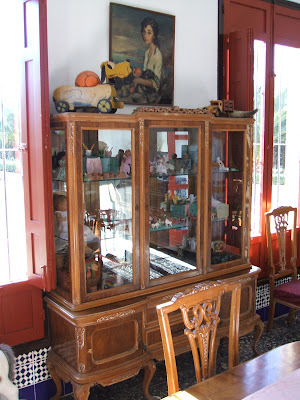 The entrants will be on display in the Municipal Library (in the Auditorium Francisco Grau). I wonder if they would accept entries in English! 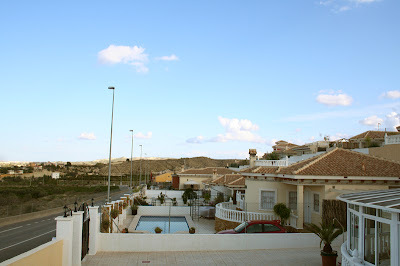 Yesterday we went down to Torre to meet Chris and Linda at 11:00am. They are over here to view their house at Playa Golf which is now near completion. Chris and I, along with Rob Franklin were Assistant Headteacher's at Anfield Comp. so we had a lot to chew over. The school closed in July this year when it merged with the neighbouring Breckfield Comp. to become the North Liverpool Academy. We knew the transition was going to be difficult which is one of the reasons Rob and I decided to retire early. It was fascinating to hear all that had transpired since we left most of which we could have predicted. Anyway back to the story. We met Chris and Linda outside their hotel and after a couple of coffees at the Casino walked along the front at Torrevieja. It was surprising how many "lookie lookie" men pestered us. We can only assume they have a sixth sense for who are residents and who are visitors. Linda bought a D&G belt for 20€ which the man assured us was genuine! Chris bought a pair of Oakley sunglasses for 5€ which again were the real thing! We had lunch at El Muelle and then sauntered back to our car. We brought Chris and Linda back to Bigastro to see La Casa Willo and where we live. Finally we returned them back to their hotel at about 10:30pm. We had a wonderful day with Chris and Linda. The only downside was that we are not used to talking that much and so had raspy voices by the time we got back to Bigastro. Hopefully we will be in fine tune to sing to the children at the local primary school this afternoon. 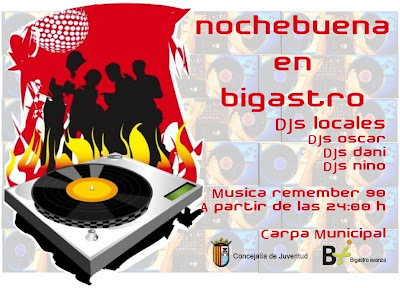 The Council of Youth have organized a disco for the young people of Bigastro in the Carpa Municipal (I'm not sure where that is). From the midnight on Christmas Eve, they will be able to enjoy "Remember Music of the 90s", with local DJs: DJ Oscar, DJ Dani and DJ Nino. Bear in mind that traditionally Spaniards don't bother going to bed on Christmas Eve this could go on until dawn! In case that is not enough, it looks like the Metro Club are having a rave on the same night. PS Pam, where did we put the cotton wool? There is nothing like a good carol concert to get you in the mood for Christmas. Last night at the Auditorium we were treated to "el cantar excelente" . 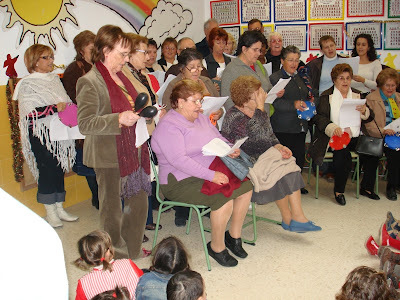 The choir, which must have been over one hundred strong, sang traditional carols and Christmas songs from Spain, from the Murcia region, from South America and finally from North America and England. As an encore they demonstrated how we should sing "El Chocolatero", the children's carol which we will be joining in with on Monday. It was just a pity that there weren't more people from Villas Andrea at the concert. They would have enjoyed it. OK I will come clean! Toni and Frank are coming to their villa today so it is only right that I explain. Their house is not for sale, well not as far as I know. The Se Vende (for sale) sign on their gates was pasted onto the photograph by me as a joke. I had considered pasting out their car and pasting in some people in their garden but I thought that would be too cruel. So there you go. Welcome back Toni and Frank. ; have a great Christmas. Oh yes and thank you for bringing us some sunshine back. Belen is of course Spanish for Bethlehem. In a country where Christmas is still about the birth of Jesus, the depiction of the nativity is important. Most homes will have a Belen like ours on display. In towns and cities though there will be much grander and more comprehensive displays for the public to visit. 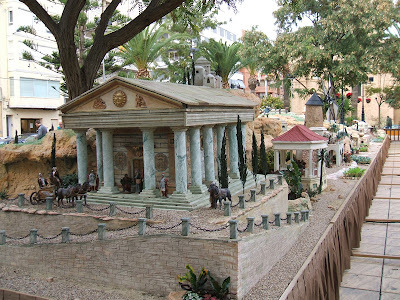 The Belen in Torrevieja is particularly impressive and shows the full story of the nativity in a series of tableaux. It is located in the Plaza de la Constitution in front of the Immaculada Church on Calle Ramon Galud. Along with Joseph and Mary, baby Jesus in the manger, three wise men, the Angel Gabriel, shepherds and an assortment of donkeys and sheep there is an 'extra' who plays his own small but significant part. His name is 'Caganer' which translates as 'Sh*****'. Apparently this little figure was added to the traditional Belen by the Catalans in the late 18th century and has been adopted and become a popular figure all over Spain. The exact origin of Caganer is unclear and there are several theories. Firstly that he represents the fertilisation of the earth to ensure a Buena cosecha (or good harvest); secondly that he represents the equality of all people regardless of gender, race, creed or colour (i.e. everyone has to do it). Some claim it is purely scatological humour or simply a game designed to entertain children. This tradition has evolved since the 1940's and in addition to the original Caganer it is now common to find him depicted as pop stars, political figures, celebrities, Father Christmas, devils, Spanish royalty and even the Pope! 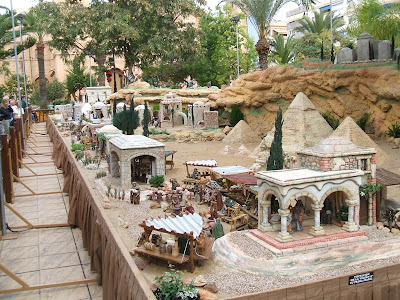 If you visit the Belen in Torrevieja, see if you can find him sitting on the toilet with his trousers down. There is a popular expression relating to the act, "Menja be, caga fort!" which translates as "Eat well, s**t strong!" - something to remember as you tuck into turkey with all the trimmings on Christmas Day! 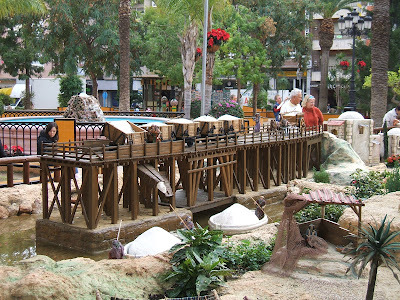 There is even a tableaux representing the salt industry in Torrevieja. Last night was the Villas Andrea Residents' Christmas party up at the Pedrera. Attendance was lower than previous occasions but then apparently quite a few people have gone back to the UK for Christmas. The Residents' Committee did well to get any entertainment at this time of year. To get two acts must have been very difficult. 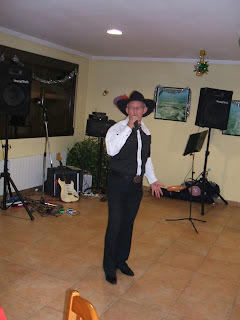 First up was Texas Ted from Playa Flamenca. No prizes for guessing that Ted is a country and western singer. He did well to sing to an audience that wasn't quite warmed up i.e. they hadn't had enough to drink by then. 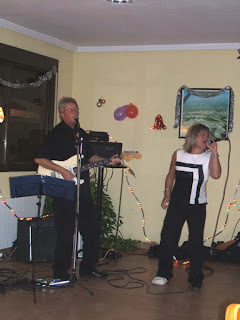 Then we had the raffle followed by Night and Day, a singing duo. They performed two spots with a short break in between. The lady had unfortunately had an accident of some sort and was hobbling with a plaster cast on her right leg. That didn't stop them performing a selection which included numbers from the Everley Brothers to Rowan Keating. They were good. Unfortunately their second spot was cut short when the lady fell. We all heard the crack as her head hit the wall behind. For sure if it didn't hurt last night it will this morning. I hope she is all right. Anyway many thanks to the Committee for providing us with a lively start to the Christmas Festivities. Fancy a trip to northern Spain? The Leader is inviting its readers to learn Spanish and enjoy a taste of the country’s culture on a week long trip to the stunningly beautiful coastal town of Llanes, Asturias in northern Spain. The dates for the trip are from Friday 30th March to Thursday 5th April 2007. The Sports Council in Bigastro, has a set up a programme with all the members of the schools in the town, with the intention that no boy or girl goes without a toy or clothing this Christmas. Each member of all the various Sport Schools in Bigastro will be asked to provide a toy or an article of clothing. The Sports Council will then deliver them to " Caritas Bigastro " for the most underprivileged children. 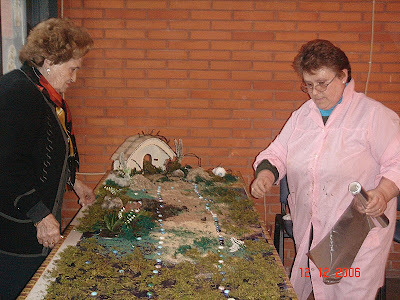 The nativity scene, for which our neighbours were painting figures, is apparently finished and on show at the Centro Social Integrado. NB I must go down and take some photos of that and also the Belen in the park. The Pensionistas are going out to sing carols over the next few days and then at 6:30 pm on the 21st they are having a party in the hall at the Social Centre. Can you tell who is the worker and who is the boss? On Saturday 25th November in the message Something for the wrinklies I said that the Town Hall had organised several events for people in the 3rd age. 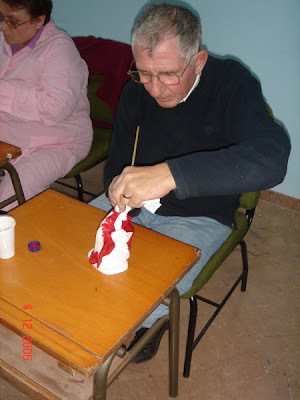 Well it looks like some of the people from Villas Andrea have been joining in by making items for the "Belen". 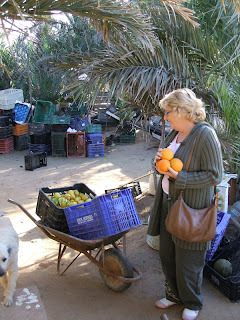 When we were walking back to the car from the farmacia, a lorry driver stopped us to ask directions. We explained we were English and asked him to speak slower. The driver then excused himself and went off to find someone else to ask. The point was he thought we were Spanish and would understand him. Of course it would have been even more rewarding if we had understood all that he said but that will come. Speaking of the farmacia - Juan invited us to go down to his shop on the 22nd when he will be giving us a present. Actually a lot of the shops and businesses will be giving small gifts during the week before Christmas. 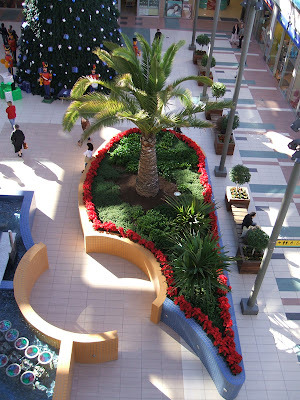 It may be a promotional product or in the case of the Garden Centres a poinsettia. 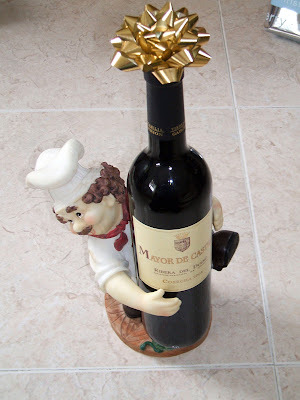 Most will have bottles of alcoholic drinks and small cups to provide a drop of Christmas cheer. It is a nice gesture to thank you for your business during the year. After we'd been to the doctors yesterday morning, we went into town to collect Pam's prescriptions and found the Post Office was still open. I must have missed the notice on the wall telling us about this last time I collected mail probably because the queue of people covered it. Now instead of being open 9-11am the Correos is open until 2:30pm weekdays and 1:30pm Saturdays. Not only that but you can send faxes and get photocopies there as well. It was always a pain to get up in time to get down there before 11. Now that we are retired we like leisurely mornings. I work on my computer and Pam has an extended sleep. Rushing down for the post was not on especially if there was nothing for us to collect. Now we can have breakfast properly and saunter down when we are ready and then have a coffee and a piece of toast with olive oil before strolling back. Thank you Correos you have made life that bit easier for us. Now if you could employ another post person to deliver up to our estate that would be even better. We've got the post boxes ready for you. It seems I have a growing number of visitors from Villas Andrea to my blog. Some apparently use it to keep in touch with what is going on whilst they are in the UK. I am flattered and hope that keeping in touch makes them want to return to Spain soon. 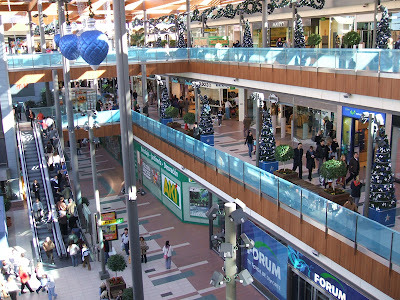 Yesterday we went to the Habaneras shopping centre on route to do our weekly food shop. It is that time of the year when the police perform spot checks on drivers. REMEMBER that you must carry at all times; your driving licence, your log book and your insurance receipts. Failure to carry these documents can result in both a hefty fine and a loss of points from your Spanish license. There is no system here in Spain, as there is in England, which allows you to take these to your local police station at a later date. If you can't pay the fine or prove who you are then your car is impounded and you walk home. Also bear in mind that very soon there will be morning spot checks, designed to catch drivers still over the limit from the night before. The drink-driving laws in Spain have tightened over recent years and tolerance is now almost zero. If in doubt DO NOT drive. Ensure that your car is in good working order, faulty lights or tyres etc. attract attention. Check that your documentation is correct, think twice about your ability to drive after alcohol and watch your speed. The Town Hall has announced another competition. This time it is for shops in Bigastro. 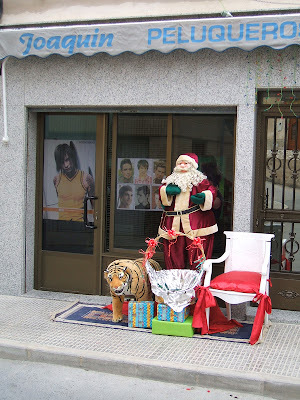 The best dressed shop window with a Christmas theme will win 300€. Second prize is 200€ and third 100€. Three judges will award up to 5 points for each display. The winner will be the one with the most points. PS We've got some spare tinsel they can borrow. Several parts of Pilar de la Horadada were cut off and flooded following the heavy rain last Friday. The Rambla that divides the town centre became a torrential river on a scale not seen since the rains of 1987. The overnight rain waterlogged fields and barrancos, but it was the sudden fall of between 90-100 litres of water per square metre at 9.30am that trapped cars, turned streets into rivers and overflowed drains. Many roads had to be closed making the town almost inaccessible until 2pm, including the road to Pinar de Campoverde and around the rambla, which coped well in its first serious test dealing with such a flood according to the Policía Local. The problems stretched up the coast to San Javier where exits from the AP-7 motorway had to be closed to Dos Mares commercial centre and Los Alcázares. Orihuela Costa urbanisations were also thrown into chaos with roads closed and the problematic N-332 underpass by the town hall at Playa Flamenca being completely flooded and blocked off. In Torrevieja, the strong winds that accompanied the extreme weather left the fishing fleet stranded in the port and paralysed the salt production works. So in comparison we got off lightly! Regional housing and territories chief Esteban González Pons has announced that his department will be carrying out checks in all 542 municipal areas in the Valencia Region in order to establish the extent of illegal building. Sr Pons said the latest techniques in digital aerial photography, a system developed by the Valencia cartography institute, will be used to identify properties that have been illegally built on non-development protected land, illegal extensions and non-licensed swimming pools. Within 15 days the photography procedure will be completed. Images will be compared to those taken by the cartography institute several years ago and illegal developments will be pinpointed. An investigation into whether other building regulations have been broken will be carried out and under the regional councillor’s new zero-tolerance policy, demolition orders could follow within six months. Illegal properties that are more than four years old can be legalised if they fulfil current requirements. Sr Pons has set a time frame of six months for the investigation process to be carried out. 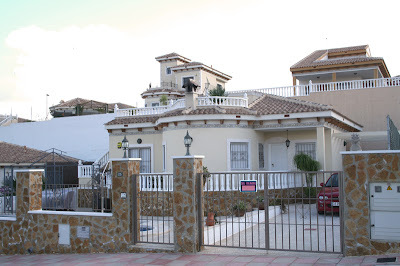 The action being taken by the regional housing department means it now takes over properties’ surveillance and inspection responsibilities from Guardia Civil Seprona units and police in the region. Sceptics claim this is another smokescreen from the Valencia government to divert attention away from pending land law issues. Now we know that our houses are legal but what about all those swimming pools and extensions that people have had built? The Town Hall in Bigastro and the Society of Progressive Women have organised a cooking competition for older participants. The theme is traditional Christmas cakes. 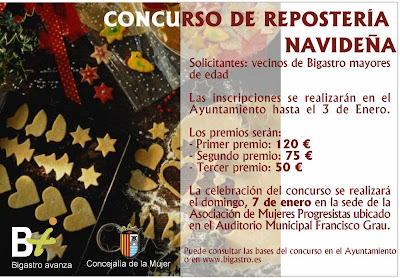 The competition, which will be judged by the Progresive Women, has three prizes; a first prize of 120€, a second prize of 75€ and a third prize of 50€. So ladies (and gents) get those rolling pins out light up the stove! The Costa Blanca is famous for its beaches. The ones by towns like Torrevieja tend to get very crowded but just go a few miles down the coast and you can find solitude. 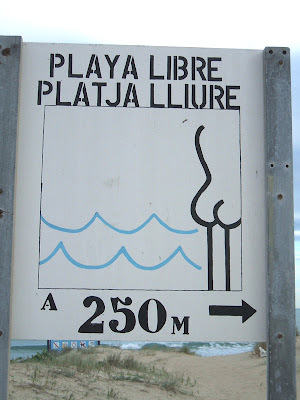 We loved the sign for this beach which conveys clearly who it is intended for. 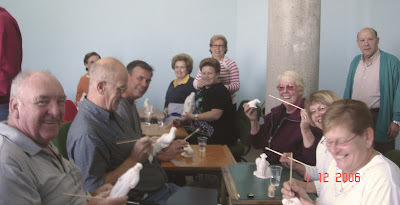 A visit to the Museum offers a glimpse back into Spain as it was. 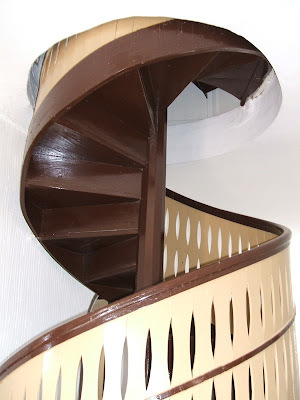 To see more of this fascinating place go to Our Spanish Album. The mince pies might be dear but if you know where to go, fruit and veg can be very cheap. Not only that but fresh and of good quality. 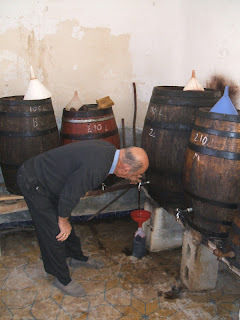 Just to wash them down what better than vino tinto from the barrel. Let them eat cake but not at these prices!